Presented in a pizza delivery box, surrounded in tissue paper, the Strawberry Sensation Chocolate Pizza from The Gourmet Chocolate Pizza Company is such a fun gift and totally yummy! With a Belgian milk chocolate base filled with freeze dried strawberries and popping candy and covered with rainbow drops, white chocolate rice balls, and sprinkled with milk chocolate curls and edible glitter, what's not to love? There is even enough to share around with friends and family and makes the perfect gift for her or any chocolate lover. 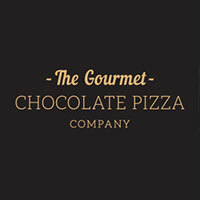 Handmade in Nottingham, our solid Belgian chocolate pizzas are made using only the finest ingredients. A unique high quality chocolate gift for chocoholics of all ages. Can’t decide between savoury and sweet? Combine your two naughtiest, most indulgent treats into one supercalifragilistic snack, with a chocolate pizza that makes your sweetest of dreams come true. The Gourmet Pizza Company create drool-worthy, unique gifts that look (almost) too good to eat.